I've ever seen for pain management. "My pain pills do more to numb my brain than my pain!" "Chronic Back Pain Shrinks "Thinking Parts' of Brain"
before years of living with chronic pain. to being much more so within just 45 minutes! I simply am sharing that it IS the case! a brain scan and discuss this with him or her. When I do, I shall update this page accordingly. call your pharmacist and ask if there any contraindications for it based upon your Rx's and OTC usage. was too controlled by the side effects of numerous prescription drugs. Thus, if you still take multiple Rx's for pain, anxiety, depression and insomnia, daily or as the rule, you may not benefit from PS either. make pain pills the rare exception and not the rule! And since I discovered that Bromelain potentiates (increases) the benefits of my pain pills, I now take my Turmeric and Bromelain WITH my pain pills and when I am severely flared, 3 pain pills are often 2 pain pill days instead, because these herbs make that much of a difference! and rare ever need Xanax! To learn more about Holy Basil Extract, click first link above. that can vastly improve your day to day living! Talk to your doctor(s) and pharmacist. Let them know what you want to try and why. health ills such as organ failure and/or death. 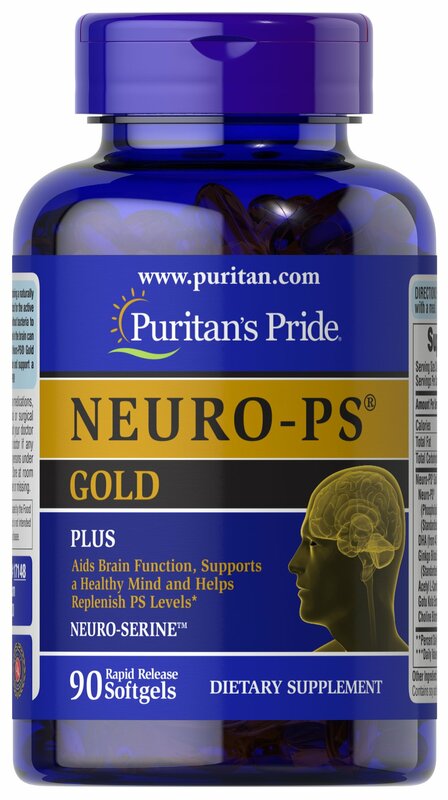 Puritan's Pride sells Phosphatidylserine as well as many of the supplements that I have and am taking. after I cleansed with ACV! in just 6 weeks from doing this! That wasn't actually my original goal but it was a LOVELY bonus! Isn't it funny how prescription drugs only bring nasty side effects but natural methods bring unexpected healthy ones?! Puritan's Pride has THE BEST PRICES on it I've found! In 2013, I came across Dr. Rudy Tanzi on TV. His show was called "Super Brain". Knowing that years of chronic pain, its stress, and manyRx's had taken its toll on my brain, I was immediately interested in seeing what he had to say. Dr. Tanzi's focus is to help people avoid developing Alzheimer's. He advised a list of specific vitamins and supplements to take to develop what he calls a "Super Brain". One is Fish Oil - check; already on it for years. B vitamins - check; on a Super B complex since Spring of 2001 and discovered it was the cure for not enduring daily headaches and/or migraines anymore! Another is Alpha Lipoic Acid. I was on it before my spinal/shoulder injuries and discontinued it. Thus, I ordered it and resumed taking daily, check. Better yet, I discovered in my handy dandy "Pill Book Guide to Natural Medicines" (pictured on STB2G "Recommended Reading" page, link below) by Dr. Michael Murray that ALA is actually written as a prescription by doctors in Germany for NERVE PAIN. One was Phosphatidylserine. Yes, it's a mouthful, but don't let that intimidate you. What is interesting to me is that several years ago, I ordered a phosphatidylserine product called "Neuro-PS" that was for this very purpose; but again as said above, I was on so many pain/related Rx's that I didn't notice any cognitive improvement whatsoever. Thus, after taking what I bought, I discontinued use. I went herbal starting January 2012 and was off Rx's as the rule since then; thus, I ordered this product again, WOW! What a tremendous and fast response! The very same supplement, in the same 200mg dose that yielded absolutely no discernible cognitive improvements when on a myriad of prescription drugs, now made all the difference in the world, since these Rx's were now the exception in my body! You see, even though I went herbal in early 2012, the six plus years of numerous Rx's had left behind many new health issues, including cognitive damage. This was deeply concerning because at barely 46 years of age, I knew I was too young to be so old! I did my best to get through each day and finally, I remembered Dr. Tanzi's show. I couldn't remember the entire list, but I did recall the Phosphatidylserine and did my research online and in my two "health bibles" and decided to give it a try. THANK GOD and I did! It was and continues to be amazing! I woke up the 5th morning after starting it and was happily shocked (two words that don't usually go together but just fit this moment!) to find myself feeling alert just 45 minutes after waking! That was a drastic improvement for which I was immensely grateful! When doing my research about Phosphatidylserine, I came across the note below on WebMD. Needless to say, when I was done reading it, I shot my online supplement company an email asking them to please confirm that their product was soy based because even if mad cow disease hadn't come to be, I still wouldn't knowingly take a product made from cow brains.